As the Woodburn Bulldogs and North Marion Huskies gear up for the coming District Championships, the two wrestling program got one last opportunity to square off on the mat in the regular season last week. Woodburn hosted North Marion, Molalla and Estacada on Jan. 30 in its final home event of the regular season, honoring the team's senior wrestlers and sending them off on a high note by posting wins over all three visiting teams. The Bulldogs opened with a 51-30 victory over the Estacada Rangers and followed with a 41-33 win over Molalla beore concluding the night with a 54-12 takedown over the Huskies. North Marion was swept in their appearances — losing 57-21 to Estacada and 54-24 to Molalla — but recorded a number of solid individual victories from likely state tournament contenders. The Bulldogs had little trouble in their opening match against the Estacada Rangers. Freshman 106-pounder Bryan Hernandez kicked things off with an 18-2 technical fall over Kaiden King, sparking a run of five consecutive victories for the Bulldogs to take a 29-0 lead. Following the Rangers' first victory of the afternoon, senior Angel Acevedo picked up a second-round pinfall over Mara Eakin, starting another run that put Wodburn up 51-6 with four matches to go. Estacada reeled off a pair of victories at the 182- and 195-pound weight classes, and the Bulldogs forfeit the final two weights to wrap up the dual. The second dual of the day, against Molalla, was much more in doubt before the Bulldogs' middle weight wrestlers pulled ahead. Hernandez fell in his opening match to the Indians' Dustin Asher, but Wesley Vasquez and Marcos Hernandez scored a pair of quick victories in under a minute to give Woodburn a 12-6 lead. Freddy Hernandez fell in a close 8-6 decision against Maximus Tate at 126 pounds, but the Bulldogs rallied once again. Hector Paniagua took down Colby Findley by 22-6 technical fall, followed by pins in the next three matches for teammates William Sandoval, Acevedo and Giovanni Bravo to give Woodburn a 35-9 lead. But the Indians weren't going to give up. Emmett Smyth scored a second-round pin over Woodburn's Israel Paniagua at 160 pounds, and Molalla rallied for three consecutive pins to cut the Bulldogs' lead to 35-27. With Woodburn giving up a forfeit victory at 220 pounds, sophomore Jaime Cruz needed to pull out a victory in his 195-pound match to stave off an improbable Molalla comeback. Cruz responded with a second-round pin over Chase Martin, securing the victory for the Bulldogs. 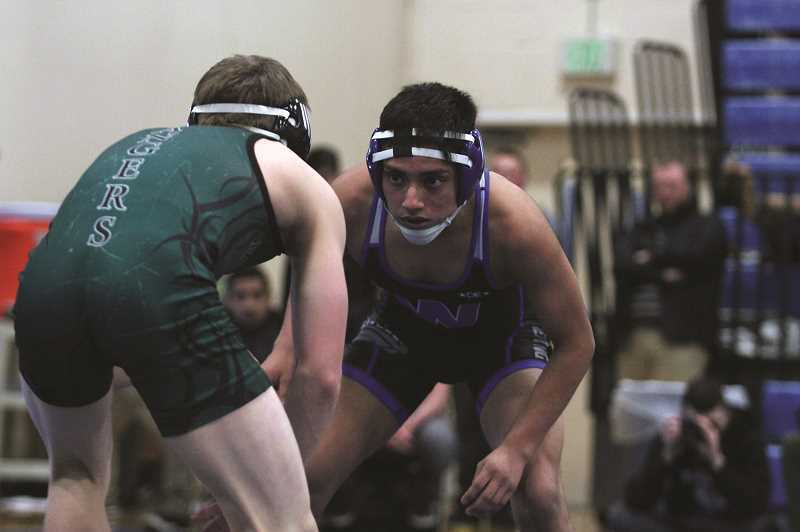 In the final dual against North Marion, the Bulldogs followed the same trajectory they had taken in their win over Estacada. But the Huskies top two wrestlers — Avidan Sanchez and Saul Tarula — were determined to stop the streak, picking up decisions over Acevedo and Bravo to put North Marion on the scoreboard. North Marion picked up one more victory, a second-round pin by Roberto Corall Ibarra over Axel Evendano in the 182-pound match to bring the dual to its conclusion. The Huskies opened the event against Estacada, where Justin McConkey started things off with a pinfall victory at 113-pounds. The Huskies won four of the first seven matches to take a 21-15 lead, but the Rangers closed out the dual with seven consecutive wins by pinfall or forfeit to take the 57-21 win. In the middle dual, North Marion's top wrestlers — McConkey, Wyatt Haberstitch, Sanchez and Tarula — each won their matches by pinfall. But the Molalla Indians swept the remaining weight classes to secure their 54-24 victory. The Woodburn and North Marion wrestling teams move on this week to the District Championship tournament held at Tillamook High School on Friday and Saturday.